As you already know I have a love of recipes found within the America's Test Kitchen cookbooks series. I appreciate that the team at America's Test Kitchen outlines their use of "normal", easy to find ingredients as well as their explanations of technique for guarentteed successes in cooking. To me there is nothing more frustrating than attempting to make a recipe that looks awesome (thank you super camera man) and when I make it it turns out looking (and tasting) like crap. In our experience, thus far, all of our attempts at recipes found within the various America's Test Kitchen cookbooks have proven to be amazing...even when we've had to make minor substitutions to ensure gluten free safety (gluten free flour, soy sauce etc). Check out this one from America's Test Kitchen Healthy Family Cookbook , I promise you'll enjoy the smooth aromatic flavorful disk as much as we did. 1) For the shrimp: Toss the shrimp with the soy sauce and rice wine in a bowl and marinate for at least 10 minutes or up to 1 hour. 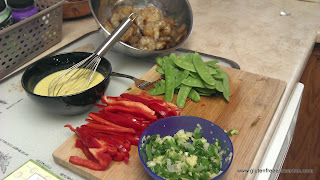 2) For the stir-fry: Combine the scallions, garlic, ginger and 1 teaspoon of the oil in a bowl. 3) Heat 2 teaspoons more oil in a 12- inch non-stick skillet over high heat until just smoking. Add the shrimp, break up any shrimp that stick together, and cook until lightly browned on all sides, but not fully cooked, about 1 and 1/2 minutes. Transfer to a bowl, and set aside. 4) Add the remaining 2 teaspoons oil to the skillet and return to high until simmering. Add the bell peppers and cook until almost crisp-tender, 2-3 minutes. Add the snow peas and cook until the vegetables are crisp-tender, about 1 minute longer. 5) Clear the center of the skillet, add the garlic mixture, and cook, mashing the mixture into the pan, until fragrant, 15-30 seconds. Stir it into the vegetables. 6) Return the shrimp, with any accumulated juice, to the skillet. Whisk the Coconut Curry Sauce to recombine, then add to the skillet. 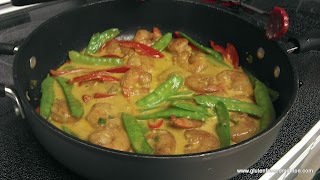 Simmer, tossing constantly until the shrimp are cooked through and the sauce has thickened, 30 seconds to 2 minutes. Serve immediately with rice. Chinese rice cooking wine is not the same as rice wine vinegar. Rice cooking wine is a rich-flavored liquid made from fermented, glutinous rice and is used for both drinking and cooking. If you cannot find Chinese rice cooking wine, dry sherry is a decedent substitute. Glutinous rice does not contain gluten, it is simply a word used to describe the sticky, glue-like nature of the particular type of rice.